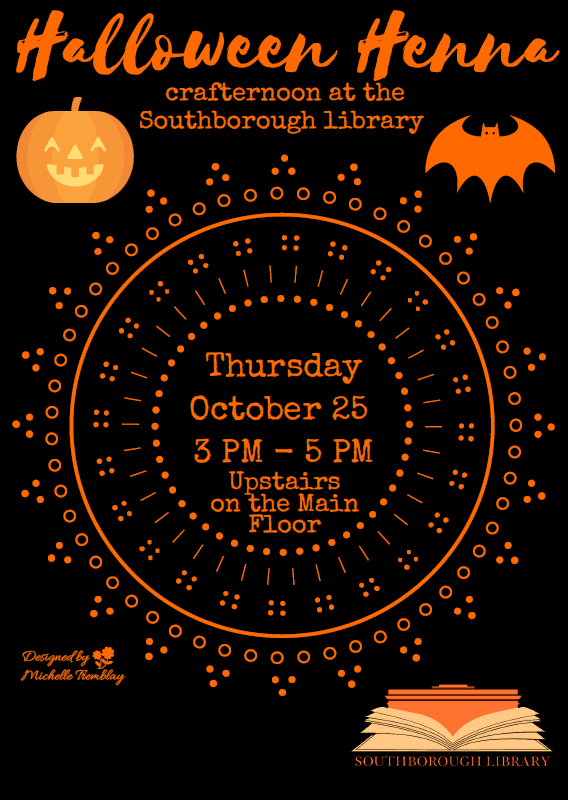 The Southborough Library is bringing back a popular “Crafternoon” for tweens and teens (ages 8+). Mandy Roberge from Wicked Good Henna is returning with her most-in-demand specialty – Henna Tattoos. No registration is required – but kids will need to be among the first 50 to show up. Embracing the season, Roberge will offer “spooky-themed” designs. For past examples of her Halloween themed offerings click on the thumbnail left. But, the program isn’t limited to Halloween tattoos. 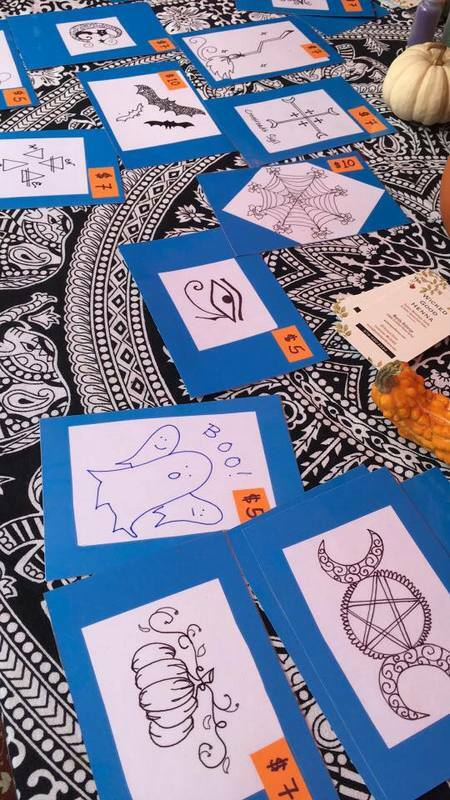 Participants can also pick any of her more traditional-themed designs. The Crafternoon is Thursday, October 25 starting at 3:00 pm. As you probably know – programming space is limited these days. If the weather cooperates, the fun will take place at Roberge’s tent. But it’s rain or shine with the inside Main Floor as backup location. For those of you unfamiliar with henna tattoos, Roberge’s website describes it as henna paste patterns are “glued” to the skin with a lemon-sugar mixture and kept on for hours to stain the skin. When applied properly, the stain darkens over several days before it begins to fade away. Yes! I make my henna myself, and the ingredients are pure and simple: Henna Powder (the powder is made from the crushed leaf of the henna plant, which is indigenous to countries in the Middle East and North Africa, where the climate is just right), Lemon Juice and Essential Oils. For oils, I use any blend of the following: cajeput, lavender, and clove. I occasionally add peppermint tea or coffee in order to achieve the right consistency. With children and teens with sensory issues and sensitivities, they can interpret the cool feeling of the henna paste as a “burning” feeling, but it is not actually burning their skin. My henna paste is 100% percent safe for people with all skin types, and is only a true risk (albeit non-life threatening) for someone with a citrus allergy.